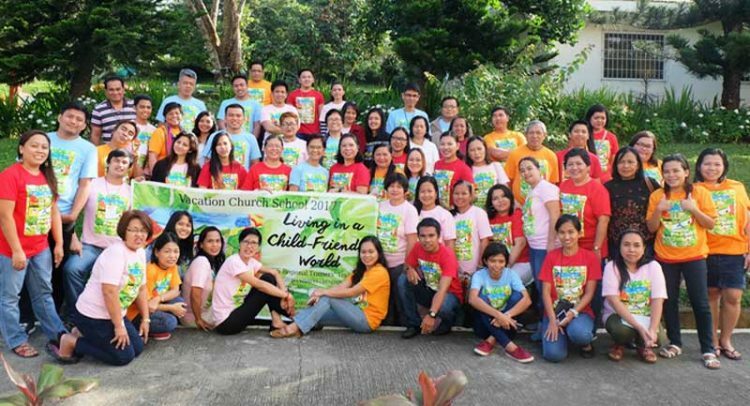 Sixty-four new trainers from NCCP member churches from Metro Manila and Luzon completed the workshops on the 2017 Vacation Church School (VCS) modules at the UMC Tagaytay Mission Camp last February 7-9, 2017. “The Vacation Church School is an ecumenical commitment of the NCCP to provide an enjoyable, meaningful, and holistic learning experience for children,” said Ms. Arceli Bile, NCCP Program Coordinator on Women. Themed: “Living in a Child Friendly World,” Christian educators from the Asuncion A. Perez Memorial Center Inc. of the United Methodist Church (UMC), Episcopal Church in the Philippines (ECP), Iglesia Evangelica Metodista En Las Islas Filipinas (IEMELIF), Iglesia Filipina Independiente (IFI), Iglesia Unida Ekyumenikal (IUE), and United Church of Christ in the Philippines (UCCP), focused on children’s rights in the workshops. “The VCS is one of our many endeavors to continuously educate our children, our next generation of leaders, on different issues and themes. This year we highlight the importance of relationship, respect and the fullness of life,” said Bile. As a main focus, the current children situation and advocacy was given by Ms. Madella Santiago of Salinlahi and Ms. Jass Gonzaga Beroga of Children’s Rehabilitation Center. Pastor Kakay Pamaran from the Union Theological Seminary shared the Biblico-Theological Reflection in this regional training. Facilitators at the Luzon VCS Regional Trainers’ Training 2017 were Deaconness Princess Zarla J. Raguindin, Deaconness Rubylin A. Litao, Rev. Oscar P. Lopez, Jr., and Ms. Arceli Bile. Regional VCS Training for Mindanao is set on February 14-16, 2017 in Davao City and Regional VCS Training for Visayas will be on Feb. 23-25,2017 in IloIlo City.